World 5 is the fifth world traveled to in Super Mario 3D Land. The setting of this world is an orange canyon in the sunset with small, yellowish-green cacti and large mountains. There is a small sandstorm occurring in the background. World 5 contains six levels and a Toad House. 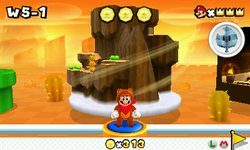 World 5-1 A desert level which introduces the Boomerang Flower power-up. World 5-2 A temple area with a top-down camera perspective, as an homage to the The Legend of Zelda series. World 5-3 A sky level with moving platforms and spikes. Requires 40 Star Medals to be unlocked. World 5-4 An underground, maze-like level, featuring Monty Moles and Morty Moles. World 5-5 A sky-based level which is traversed using the Propeller Box. World 5- The second castle in the game. Requires 50 Star Medals to be unlocked. This page was last edited on June 23, 2018, at 00:27.